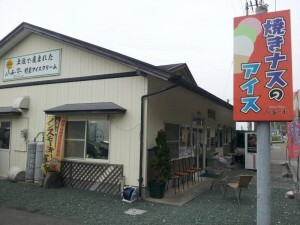 Along the road to Aki city, perched beside the ocean, there is a small shop with an orange advertisement: “Grilled Eggplant Ice Cream”. Inside, a sweet vanilla smell is drifting, and there are various ice creams in the showcase. With the first bite of grilled eggplant ice cream, the charcoal-grilled flavor spread to the mouth, never before tasted. After that first bite, the mouth demands one more. “Let’s try to change Aki!” says Tetsuya Komatsu, owner of Aki Group Farm. He and his friends have a vision to change undistinguished Aki city. Aki Group Farm, the company which makes grilled eggplant ice cream, was established by them in 1995. Komatsu was given the position of owner from a previous owner in 2005. 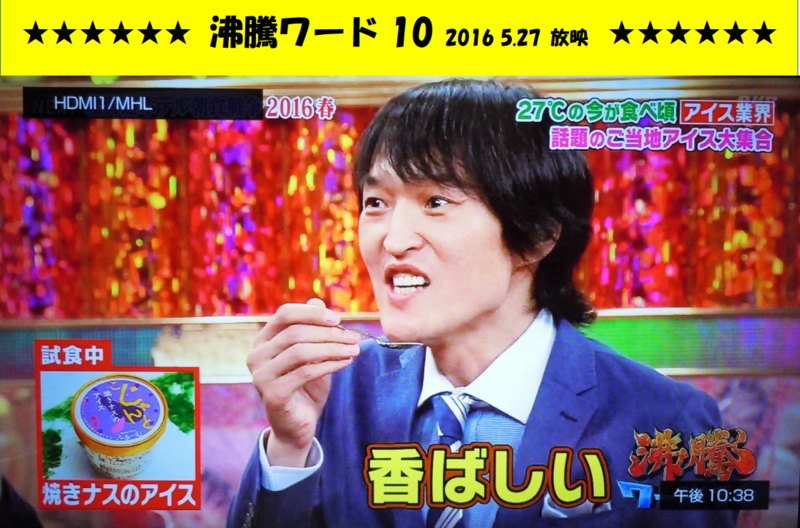 Sales of a year are about twenty million yen. In Japan, people try to make distinguished products to create their brand and show their identities. Aki Group Farm chose eggplants but there are many unusual tasted ice creams in Japan such as mushroom ice cream or chili ice cream. Most of them are used the famous products in the areas and producers aim people to eat and get to know about the areas. The grilled eggplant ice cream got Grand Gold Prize of All Japan Ice-Cream Grandprix at Foodex Japan 2012 and 2016. Also aonori flavor ice cream (seaweed ice cream) got Silver Prize at the Grand Prix in 2016. Aki city, in Kochi prefecture, has a population of 18,080 (5, 2016) but it has been decreasing every year. The main economic activity is agriculture, especially eggplant and yuzu which is citrus fruit and normally used for making flavor, are produced the largest amounts in Japan. Also chirimenjako, “dried sardine fry,” of the fishing industry, is famous too. Several companies in Aki have been trying to expand their business to Japan and the world that people get to know about their products and get to know about Aki and Kochi: wood pellet of Yasuoka heavy machinery, fruit tomato of Happy Farm and wooden toys of Mountain Whale house, and eggplant ice cream of Aki Group Farm. These four companies lead the economy in Aki, but though they are getting famous, it’s still a struggle. “We want to make Aki more famous, so we need to sell more.” Komatsu said. Grilled eggplant ice cream has been introduced a few times by some news sites, newspaper and also on TV programs. “Grilled eggplant ice cream? I can’t imagine!” Many people say. But after that first taste, they say “This is really tasty! I can taste a grilled flavor!” Once people bite the ice cream, they are attracted it. Why? What is the difference between this and other ice cream? How is the distinctive flavor captured? The poster explains how the ice cream is made. Komatsu uses only eggplant in season. In addition to eggplant ice cream, other flavors are made with finest seasonal ingredients of Kochi.And it’s not just ice cream. They also sherbet, cookies and muffins. 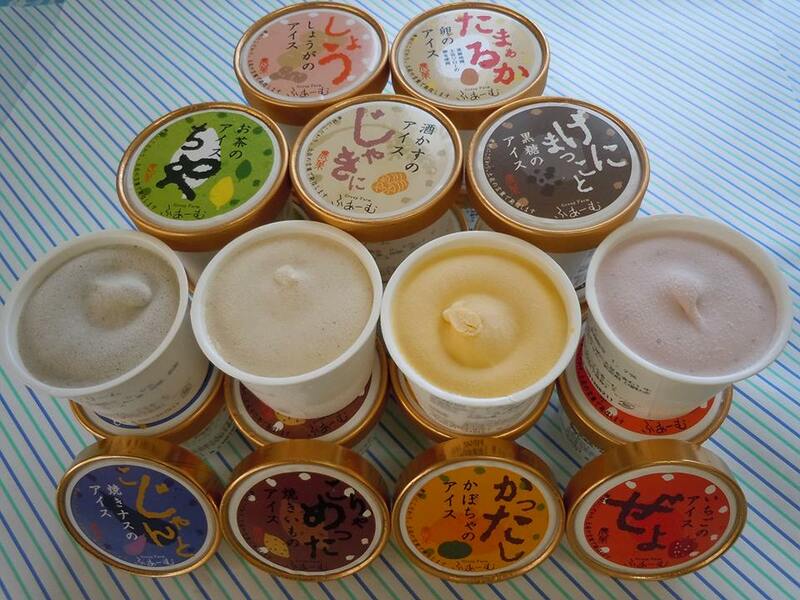 The original ice creams’ packaging uses Tosa-ben, the local dialect, such as kojanto, “very” and bocchiri, “just right”. Komatsu has been struggling to create a stable business for his one employees. And, like many other small businesses in Kochi, is trying to promote the prefectural brand. The corporate principle of Aki Group Farm is “to deliver the good taste of Kochi to urban areas”. He and his friends’ dream is people to get to know about Aki and Kochi. Kochi is a small prefecture and it’s hard to get there because of lack of transportation. People in urban areas don’t have chance to know about Kochi. If you can’t drop into the shop, you can order online. You can also get the ice creams in Kochi or outside of Kochi. In Kochi, they are sold at Hirome Market and Tencosu. In Tokyo, they are at Ore-no-Dashi (in Ginza and Akasaka) and Neboke. 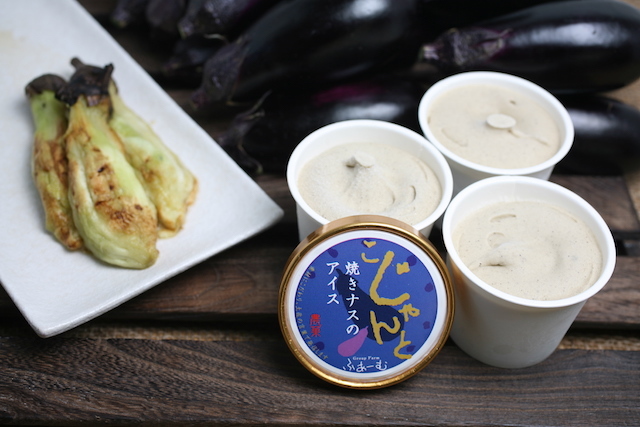 Ito-Yokado will sell grilled eggplant ice cream around Kanto area in mid-August. This is good story. I was remainded of the day when eggplant farmers from Kochi had come to my elementary school. They had told us how Kochi’s eggplants are tasty then. One owner who want his city more famous, more attractive. Maybe he would maybe he can’t, but his spirit is great! It just makes me want to go and have a bite. It would be better if this article has a bit more pictures gor us to be attracted more. I have tried this yummy icecream once! It was so exotic taste! I liked it. By the way, I didn’t know that it has won the grand gold medal in all Japan Icecream Grandpix. And I could have buy it outside of Aki city. My friends visited Kochi last week. I should have bought them this If I read this article little soon! !